In a previous post, we discussed the confusion about the definition and associated properties of diagonally dominant matrices. In this blog, we answer the next question. What is a weak diagonally dominant matrix? The answer is simple – the definition of a weak(ly) diagonally dominant matrix is identical to that of a diagonally dominant matrix as the inequality used for the check is a weak inequality of greater than or equal to (≥). See the previous post on Clearing up the confusion about diagonally dominant matrices – Part 1 where we define a diagonally dominant matrix. The time it would take to find the determinant of a matrix using the Gaussian Elimination is many-many orders less than when the cofactor method is used. In this blog, we derive the formula for a typical amount of computational time it would take to find the determinant of a nxn matrix using the forward elimination part of the Naive Gauss Elimination method. The time is compared with that using the cofactor method. The time it would take to find the determinant of a matrix using the cofactor method can be daunting. A student may not realize this as they may be limited to finding determinants of matrices of order 4×4 or less by hand. In this blog, we derive the formula for a typical amount of computational time it would take to find the determinant of a nxn matrix using the cofactor method. In the previous blog, we found the computatational time for back substitution. This is a blog that will show you how we can find the approximate time it takes to conduct forward substitution, while solving simultaneous linear equations. 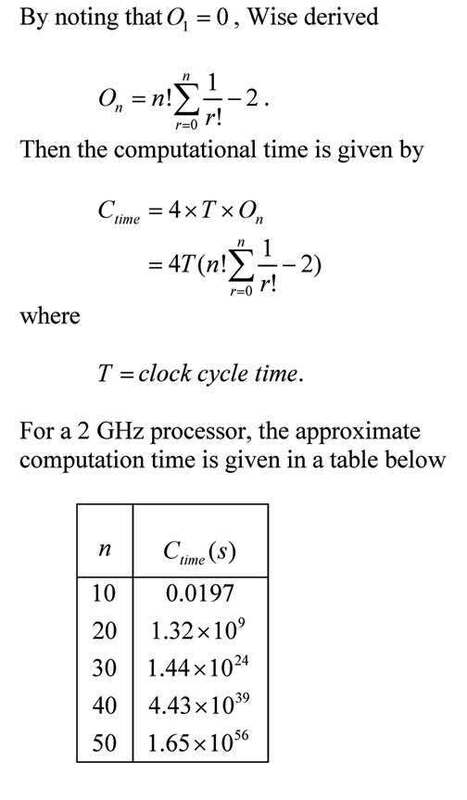 The blog assumes a AMD-K7 2.0GHz chip that uses 4 clock cycles for addition, subtraction and multiplication, while 16 clock cycles for division. Note that we are making reasonable approximations in this blog. Our main motto is to see what the computational time is proportional to – does the computational time double or quadruple if the number of equations is doubled.